Have you ever been the unfortunate victim of a temperature-related emergency? Have you lost critical network uptime, revenue, or even customers because you lost critical functions in your server room, data center, or remote site due to thermal shutdown? Each year, many networks suffer from preventable network outages due to environmental conditions their gear couldn't handle. Maybe you've been one of the lucky ones to avoid these outages, but that doesn't mean you should leave your critical network uptime to chance. The bottom line is you have too much valuable and mission-critical equipment in your server rooms, data centers, and remote sites, and you simply can't afford to leave this gear unmonitored. Leaving your network equipment unmonitored is taking an unnecessary risk. Without the right temperature software or a monitoring system in place, you won't know about a crippling network problem until it's too late. The key to protecting your network is to use the right monitoring solution. Unfortunately, too many monitoring systems fail to see the big picture, and leave out critical monitoring features you can't live without. 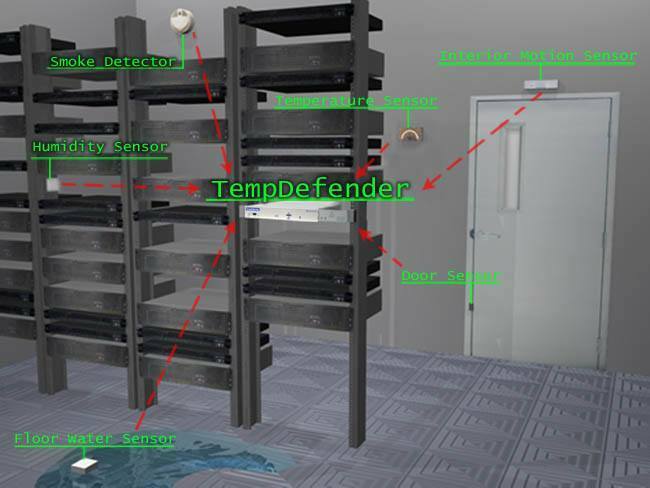 The TempDefender IT remote telemetry unit (RTU) is used to monitor temperature, humidity, water, smoke, and motion. Measuing these key conditions is critical to protecting your valuable gear. These limited systems can only provide you with a false sense of security - which is worse than having no monitoring solution at all. You'll be hit even harder if you think your network is protected, but it turns out your monitoring system just couldn't handle the job. The wrong temperature software with your monitoring system will only provide you with headaches, instead of results. Live analog monitoring - Basic discrete sensors can only tell you if the temperature has risen above a certain point, or crossed a specified threshold. This limits what you know about the situation. You want a system that supports analog sensors, which can provide you with accurate readings of the environment your precious gear is housed in. Analog sensors output within a continuous range of 4-20mA, which means they can report exact values to you at any time. 24/7 notifications - What good is a monitoring system if it has no way of alerting you of an emergency? That's why it's crucial to have a solution that can alert you via multiple methods at any time of the day. Look for a system that provides you with versatile alert methods, such as paging, email, or even voice alerts to your phone. Even if you have a 7x24 NOC, the ability to receive notifications outside the office gives you true flexibility. Easy-to-use web interface - You're a busy professional and you don't have the time to waste setting up a needlessly complicated system nor countless hours to spend training employees to use an unintuitive interface. Look for temperature software and monitoring solutions that provide you with easy-to-use and intuitive graphical interfaces. Managing your alarms shouldn't be a headache-inducing process - it should be simple and easy. Risk-free guarantee - You should only use a system that's supported with a money back guarantee. What does it say about a vendor if they aren't willing to offer a risk-free guarantee? Only work with a company that's willing to deliver proven results to you - or your money back. The first step to choosing the right solution for monitoring your network is to arm yourself with the information you need to make the right decision. You can't afford to waste your time or money on a system that can't provide you with what you need. Just picture what's possible with the right monitoring solution. Imagine how much easier your job would be if you had the ability to avoid preventable network outages. How satisfied would your customers be if they knew you are proactive and forward-thinking about providing reliable service and ensuring network uptime? Monitoring your network is a serious job, and you need a serious solution. That's why I recommend first taking a couple minutes to read the free DPS Telecom Network Alarm Monitoring Fundamentals White Paper. This free guide will provide you with a solid introduction to alarm monitoring essentials. This guide is the first step in the right direction to getting yourself the temperature software and monitoring solution you need. Without knowing the basics, you'll be exposing yourself to unnecessary risks and costly mistakes. Don't let this happen to you - learn the fundamentals of network alarm monitoring. For a free expert consultation on choosing your network monitoring solution, call (1-800-693-0351) or email (sales@dpstele.com) the DPS Telecom monitoring experts. The DPS experts can answer your questions, help you design a perfect-fit solution, or even provide you with a free Return-on-Investment (ROI) analysis - so you can see exactly how much you can save. Don't leave your network vulnerable any longer, call today. It's 5:42 AM on Thursday at our Fresno, CA, USA headquarters. It's early in the morning, but we'll start on your quote as soon as we get into the office.